First stop was up in Queensland with Kate from Tall Tales from Chiconia who stitched a beautiful feather using foundation paper piecing, isn’t her writing gorgeous too! 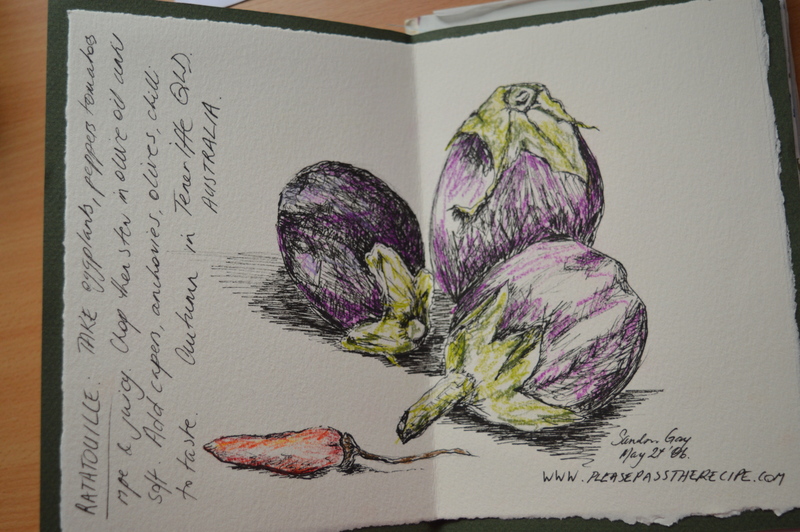 Sandra aka Lady Red Specs from Please Pass the Recipe drew a great picture of aubergines to go with her recipe for ratatouille. Chas Spain lives in Melbourne and she drew an amazing pictorial map of a cycle route into Melbourne, in the sketchbook it unfolds like a secret letter! I think the roundels which illustrate the route are stunning. 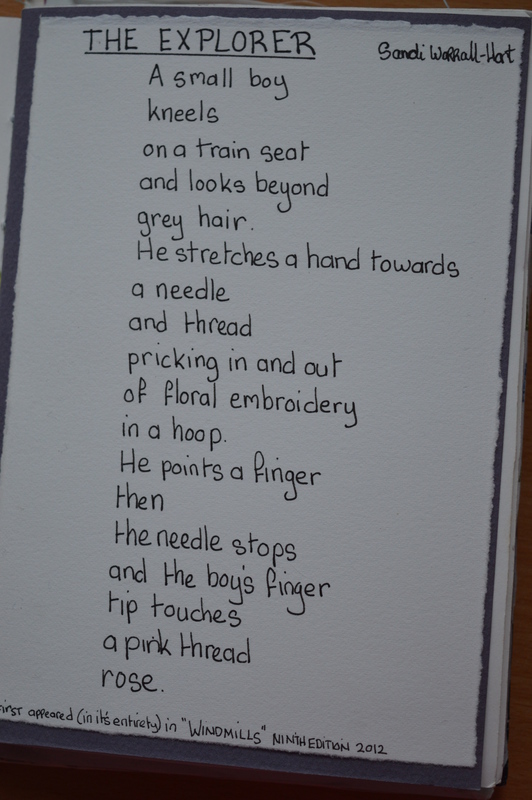 Sandi, who lives in Wandin East, wrote one of her poems in the sketchbook, I love the imagery in this poem. 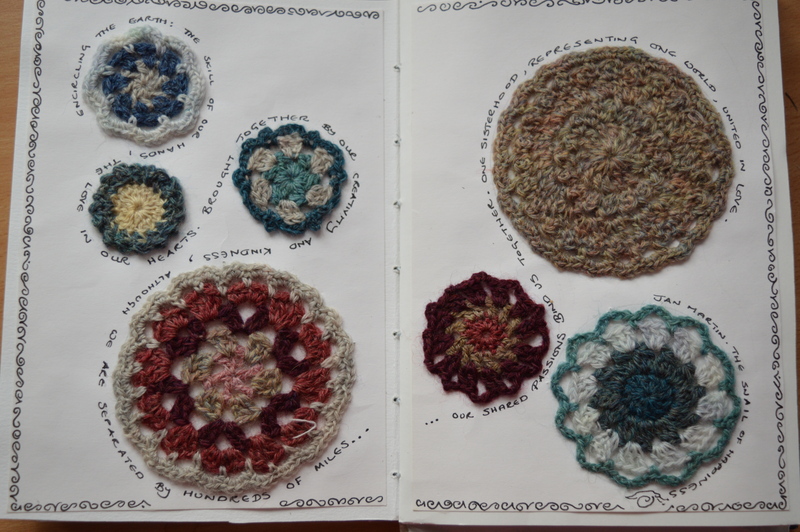 Alys from Gardening Nirvana made a sisterhood quilt from all the entries so far, it makes a lovely record of the journey at the halfway point. Sue at From The Magpie Nest stitched two lovely patchwork pictures all embellished with wonderful beads and charms together with lots of embroidery. 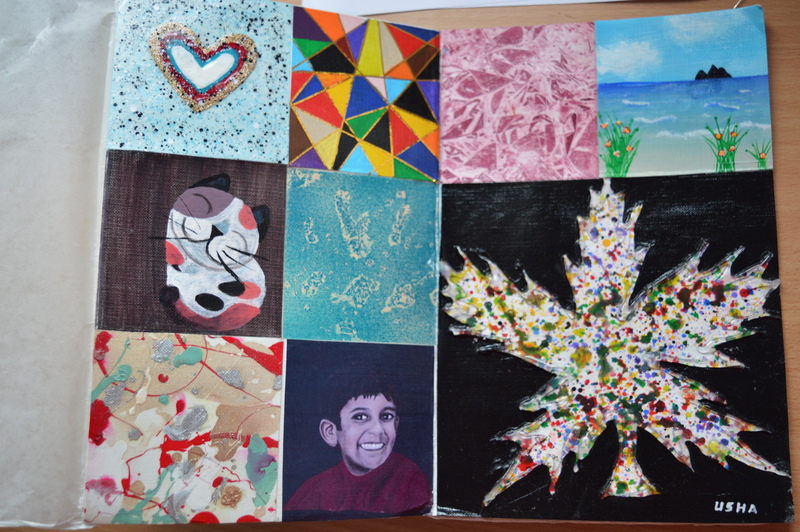 Usha from Creative Crafts DIY created an eclectic patchwork of images using lots of creative techniques. 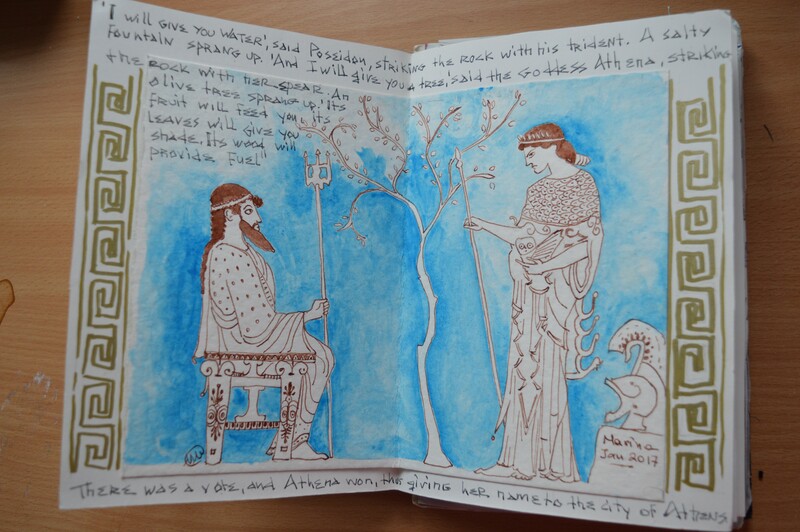 Marina, of Athens Letters , wanted to create something to reflect Greek history, she drew a fascinating picture showing Poseidon and the Goddess Athena. From Greece the sketchbook travelled over to France to visit Tialys. 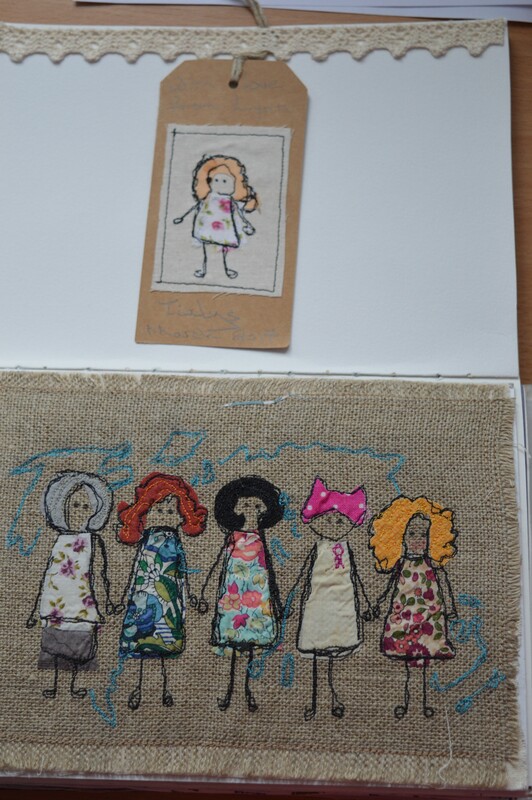 Tialys does some amazing sketches with her sewing machine, I love her style and the picture of the five ladies with the world behind them captures the spirit of the Sisterhood of the Travelling Sketchbook. 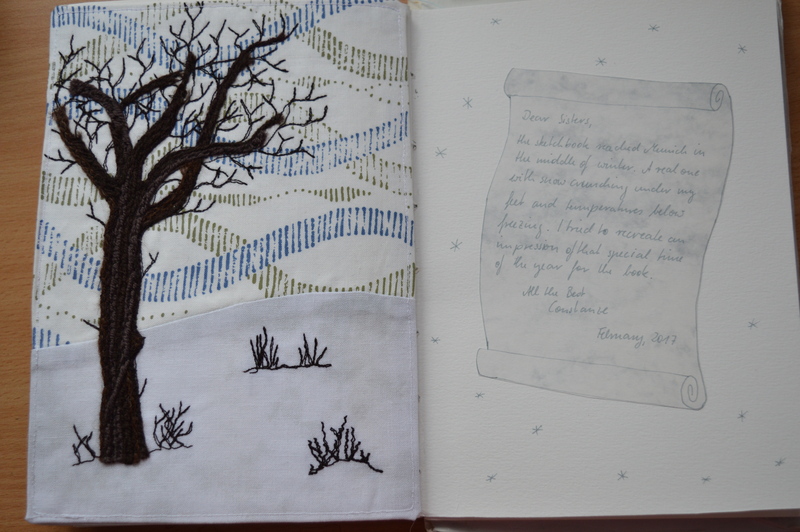 Constanze from Textile Dreamer is in Germany, her embroidery reflects beautifully the winter scenes when the sketchbook was with her. Encircling the earth: The skill of hands, the love in our hearts. Brought together by our creativity and kindness, although we are separated by hundreds of miles…our shared passions bind us together. One sisterhood, representing one world, united in love. 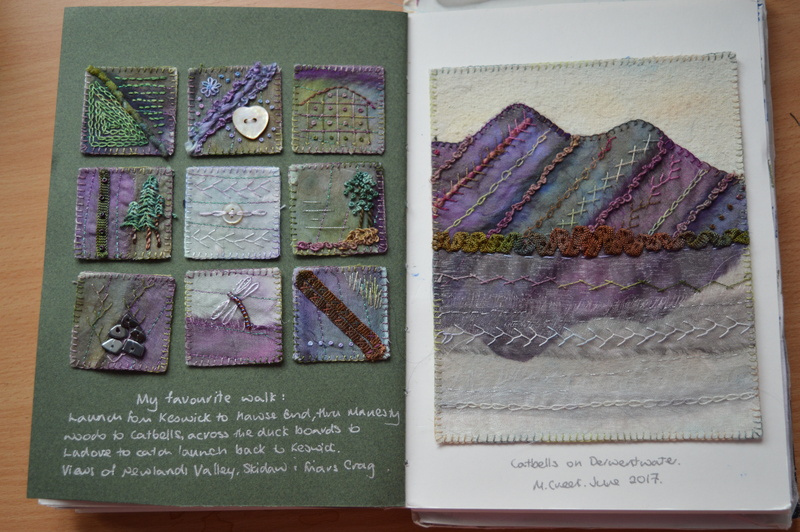 I finally completed my entry, an embroidery of Catbells with nine inchies representing my favourite walk up Catbells in the Lake District. I found a green page which set of the inchies beautifully. I wondered about writing more to explain the images, but in the end I decided to keep it fairly simple with a brief discription of the walk using a silver gel pen. 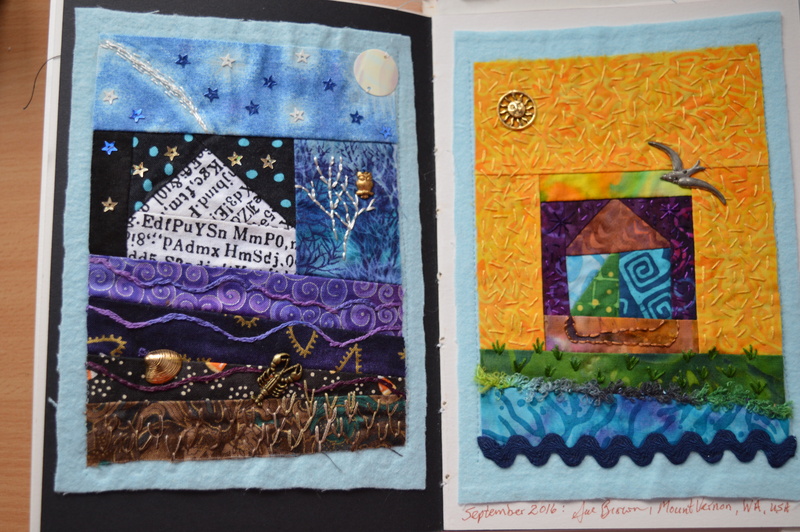 Being a part of this project has been an amazing experience, it’s great how creativity has brought us all together with such a wide variety of skills, artists, poets, quilters, embroiderers. 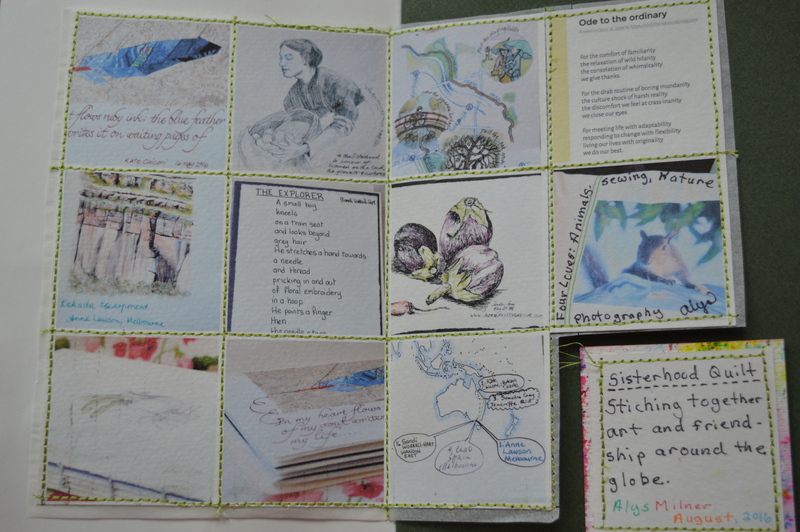 Thanks to Anne for organising The Sisterhood of the Travelling Sketchbook. 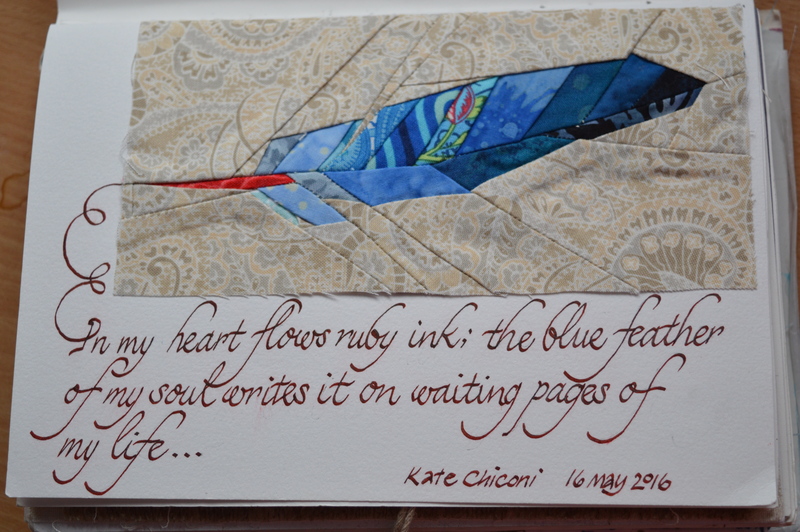 This entry was posted in Serendipity, The Travelling Sketchbook and tagged The Sisterhood of the Travelling Sketchbook. Bookmark the permalink. What a treasure….!! This is amazing !! Oh, Margaret, it was wonderful to see everybody’s contributions again! Your embroidery is beautiful addition to the Sketchbook. And soon it will be back in Australia. Great choice of page colour, too! Love how your lilac inchies look against that green. Beautiful work, Margaret, a lovely way to encapsulate the experience of your walk. One word – WOW !!! I knew this was going to be beautiful – and it is! Thanks for showing us the whole thing again! Such beautiful and creative minds in that book! Thanks for showing us how it all looks. It’s simply lovely. All ofit, I am in awe. What a stunning and beautiful treat. Each page is just amazing! A lovely keepsake. And what a great thing to be part of! Layers of Beautiful Beautious Beauty!